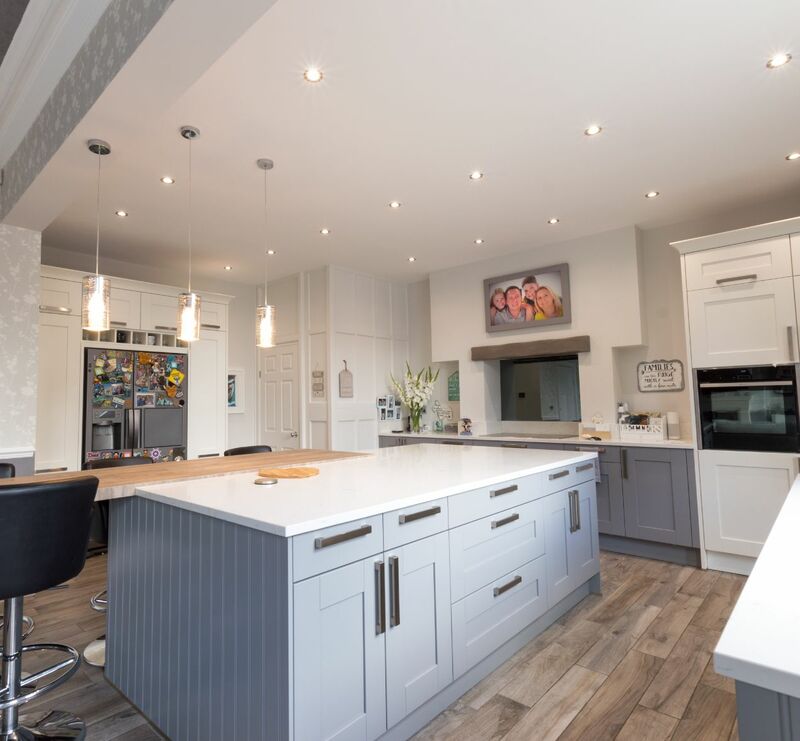 Lindsey and Adam realised their vision of a dream kitchen by combining three separate rooms into a one stunning, family-centric space. 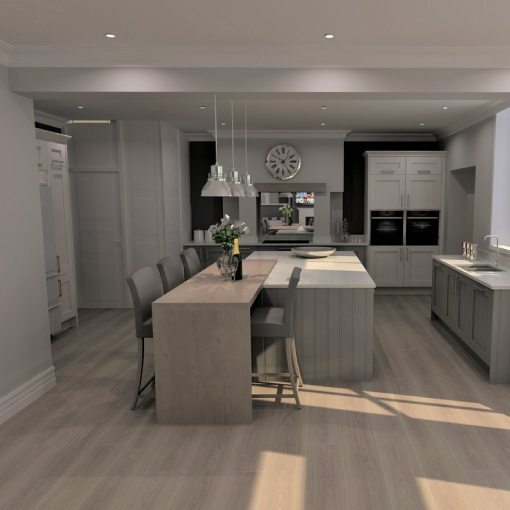 Having been given a solid recommendation for Kitchen Design Centre from an industry professional, Lindsey and Adam decided to pay a visit to their nearest showroom, located at Housing Units, Manchester. 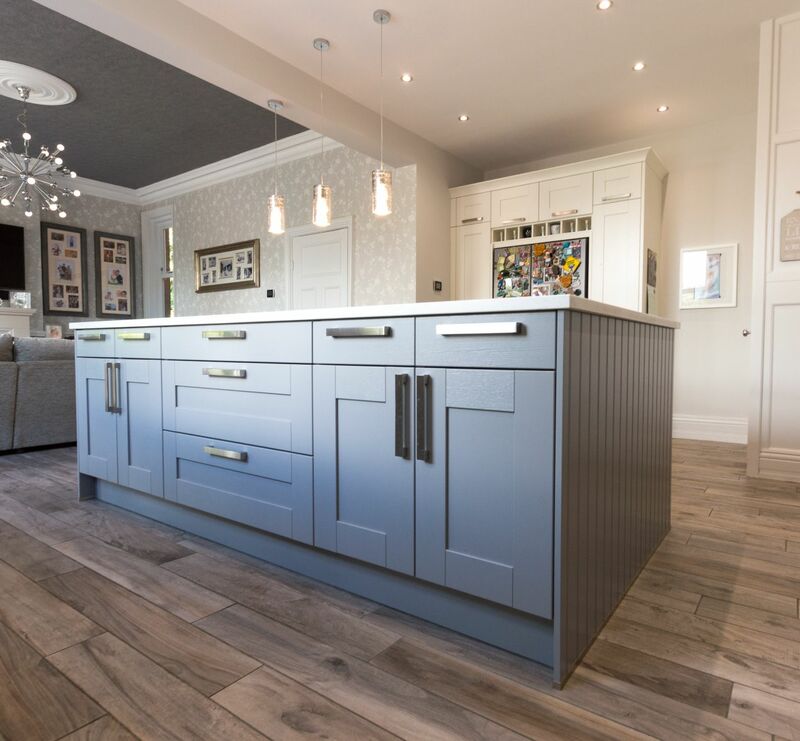 There they met John Crosby, one of our talented kitchen designers, and spotted a display kitchen with several elements they’d envisioned for their own dream kitchen. 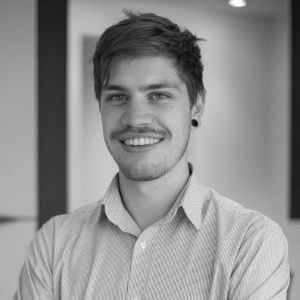 John worked closely with both Lindsey and Adam to recreate these features, making sure to integrate them into the final design. 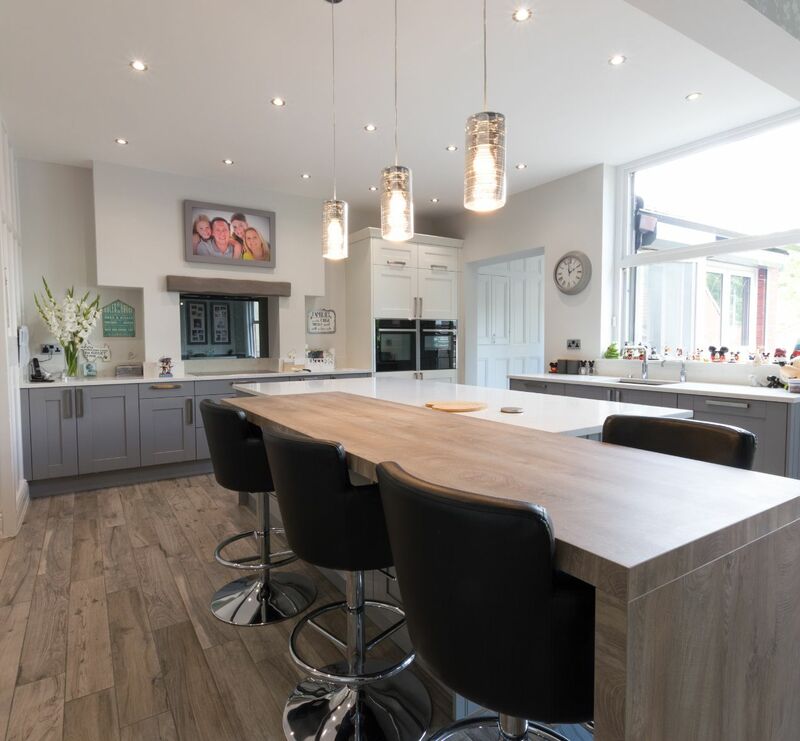 As they were looking to create a true family-centric space, one of the couple’s first key requirements for their new kitchen was to link the kitchen and lounge into a single room. 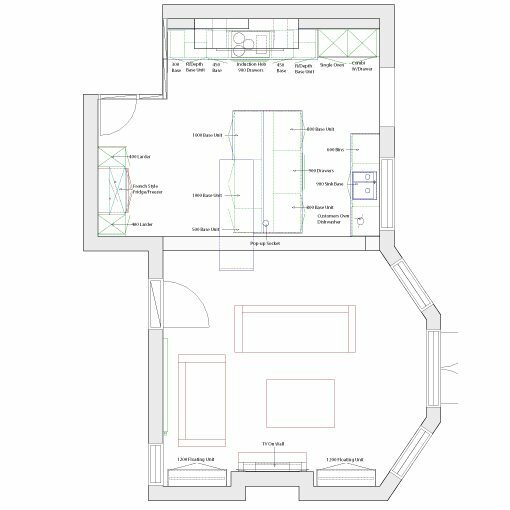 This was achieved by removing the adjoining wall; flooding the kitchen with natural light while creating a space that flows beautifully from the cooking to the living area. Lindsey and Adam were also particularly excited about the installation of their new kitchen island, another crucial factor in making a family-centric space. 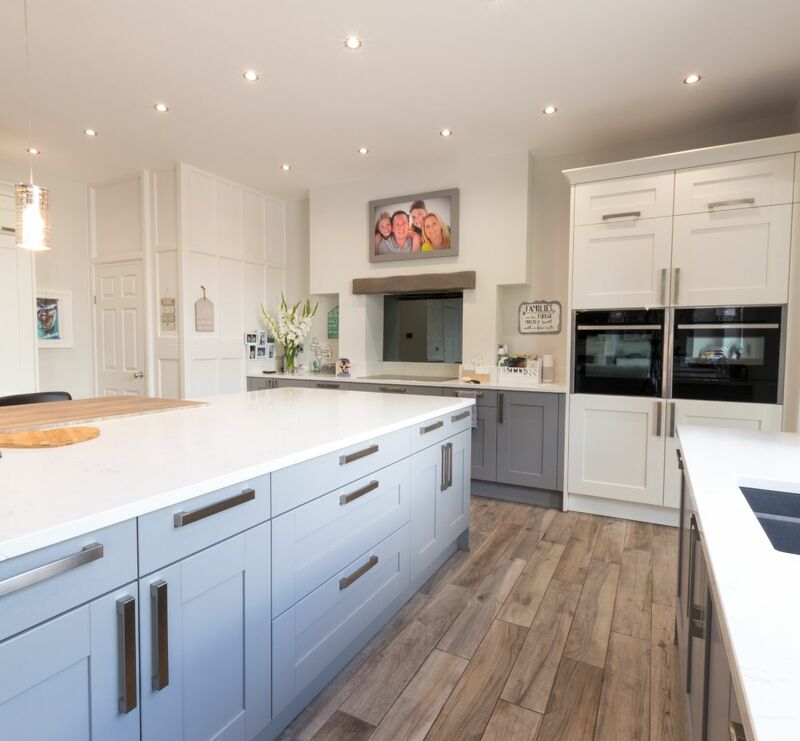 It’s finished with a bespoke piece of Quartz worktop, and along the central part of the island is a breakfast bar capable of seating the whole family. Now, they can all happily tuck into delicious meals while enjoying each other’s company. The kitchen’s hob has been built into the space under a previously-unused chimney breast, which is now home to a concealed kitchen extractor. A distressed solid oak mantle was also installed above the hob to serve as a wonderfully rustic focal point, while just underneath it, the back wall has been outfitted with a tinted mirror that gives a great illusion of extra space. The completed kitchen’s elegant but traditional style is enhanced by its kitchen cabinetry, which is outfitted with Traditional Oxford Doors in Pearl Grey, mixed with Oxford White doors. Meanwhile, the finish of 30mm Attico Quartz on the kitchen worktops allows them to share that same stunningly sophisticated feel. Complementing this look is a dazzling array of modern and contemporary appliances, in addition to the couple’s existing American fridge freezer. 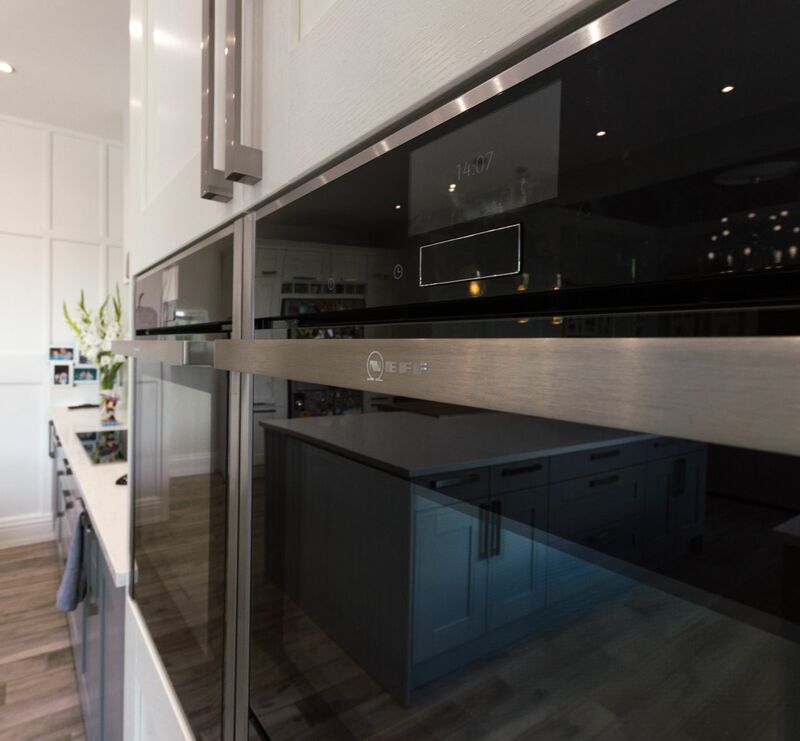 These include an 80cm induction hob, a Pyrolytic Single Oven, a Combi Microwave and a warming drawer, all from industry-leading supplier Neff. Finally, a Quooker tap has been fitted to one of the Quartz worktops. Known for its ability to provide boiling water in a pinch, the Quooker’s minimalist design was carefully chosen to prevent the worktops from looking too cluttered, which is key in maintaining the spacious feel of the open-plan design. "John’s a great guy – he even helped us out with some of our own design choices, like the pendant lights hanging above the island. 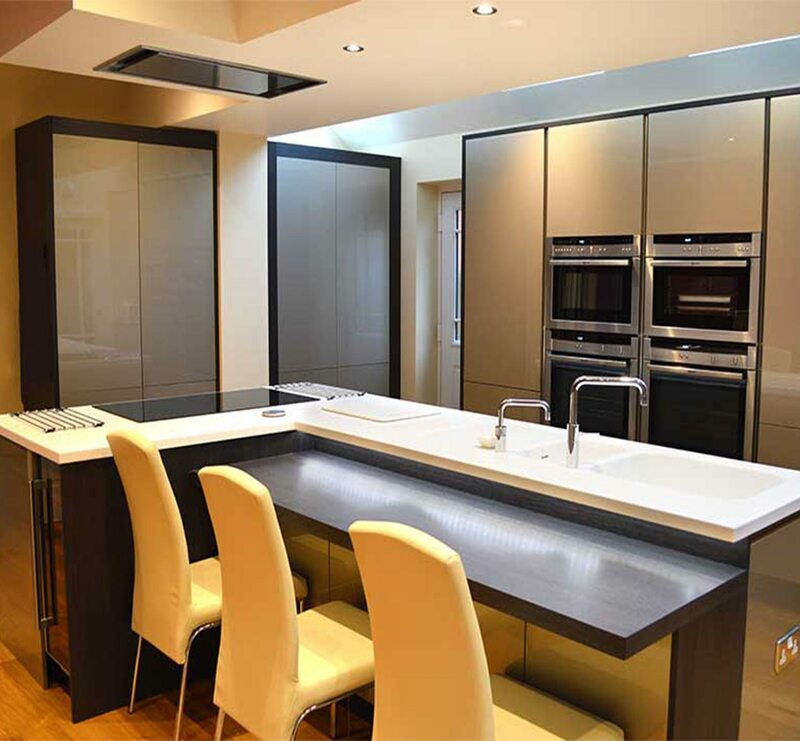 Honestly, the service from Kitchen Design Centre was very, very good!" 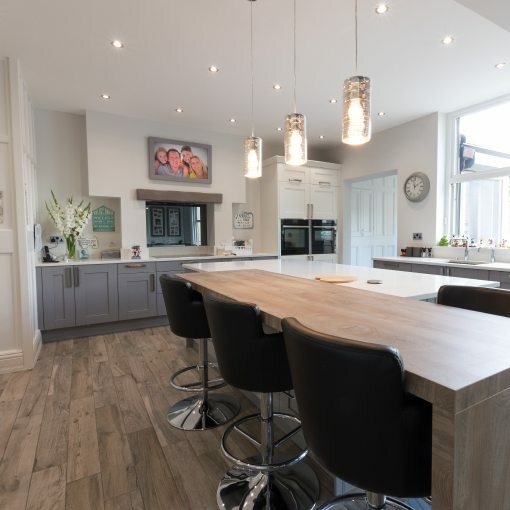 "When I arrived on-site for the first time, I noticed that the current kitchen and lounge had a lot of inherent character and a number of interesting features, such as the panelled wall ‘utility’. We decided early on that we wanted to keep these running through the room, and I was pleased to see that the chosen kitchen design and material complemented these existing features. 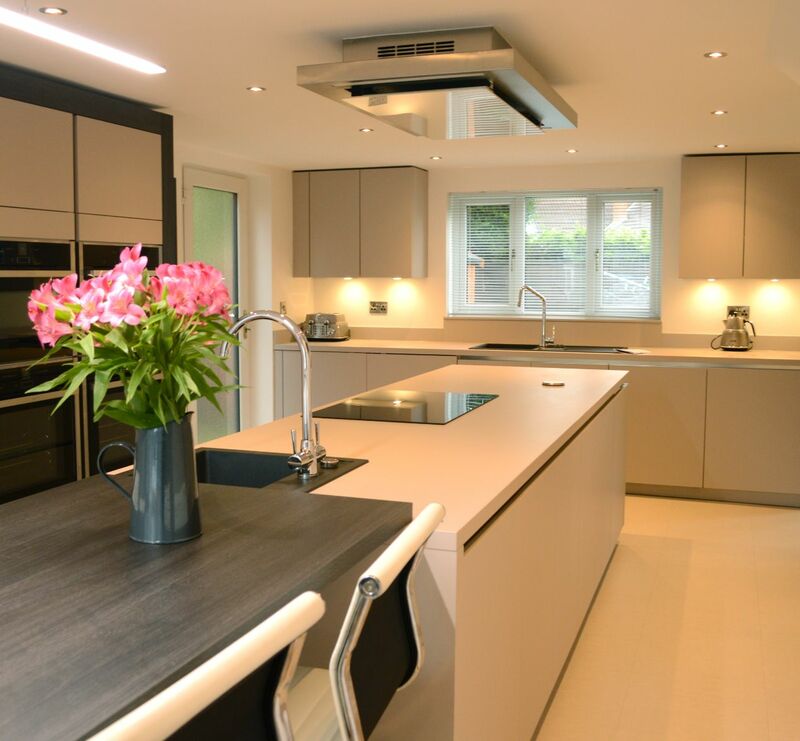 The colour choices also worked well throughout both rooms, and even though the kitchen is a ‘traditional’ design, the contemporary appliances and the final kitchen layout ultimately looked fantastic in this style of house."